tag:blogger.com,1999:blog-52271472019-03-06T04:43:51.242-05:00Greater Philadelphia Bicycle NewsThe blog of the Bicycle Coalition of Greater Philadelphia. Making your ride better since 1972.John Boylenoreply@blogger.comBlogger2930125tag:blogger.com,1999:blog-5227147.post-26875472482296608462014-05-06T09:30:00.000-04:002014-05-07T14:55:41.301-04:00Our Blog is Getting a New Home"Eventually, all good things must get face lifts." This is true both in alarmingly superficial subsections of Beverley Hills, and on the Internet. Yesterday afternoon we launched a brand-new website. You can check it out at bicyclecoalition.org (yup, same domain). But one goal of our website redesign was to better integrate our blog into the rest of the site. And so, we now have a new blog, at a new location: bicyclecoalition.org/blog. On the new blog you will find a handful of blog posts which were originally posted here. It's like with a new house - you carry over some old furniture just to have something to sit on while waiting for the PECO guy. But starting henceforth we will be filling the new blog with the blog-post-equivalent of antique mirrors, a sectional or two, and a cherry or Brazilian walnut dresser if we can find one in our budget. What does this mean for those of you who have read our blog via emails sent to your inbox? We are working to get a blog-to-email subscription service up and running soon. Until then you can use services such as Feedly.com to subscribe. What does this mean for our Yahoo group listservs? We will not be posting new blog posts to those groups, as we are trying to consolidate the channels through which we share information (we only have so much time & effort to monitor everything). However, we do want to facilitate the continued communication among those counties with active groups. Shoot an e-mail to Nicholas at nicholas@bicyclecoalition.org if you'd like to be part of that conversation. This blog will remain online as an archive. So if you want to flip through these 2,900+ blog posts and reminisce about the good old days, you can. But remember - as Peter de Vries said: "Nostalgia is not what it used to be." Thanks for reading. And thanks to the William Penn Foundation, whose funding made this website redesign possible. We'll see you at bicyclecoalition.org/blog.Anonymousnoreply@blogger.com0tag:blogger.com,1999:blog-5227147.post-38706271187835518152014-04-30T10:00:00.000-04:002014-05-01T09:36:03.140-04:00Your Guide to Bike Month in PhiladelphiaMay is Bike Month! Yes, bikes work year round. We don't celebrate "Shoes Month" after all. But we suppose at some point May wasn't anybody's month, and Bikes saw an opportunity for naming rights, and now here we are. Here is a guide to some of the many May bike rides, activities, and events happening in Philadelphia. Last year's Cyclofemme ride. Join this year's Mother's Day casual ride on May 11th. The National Bike Challenge starts in earnest. It's a free, good-natured competition to see how much you can ride your bike this summer. A great motivational tool to get in shape, finally bike to work, or encourage your friends or coworkers to give it a try. Read more here and sign up today! Schools around the country are planning Bike to School Days to encourage children (and parents) to get exercise on their way to school. If you are an educator or parent and want to organize an event at your school, read this article for more information. At long last, the Philly Pumptrack gets its official debut. CycloFemme is a global women's cycling day created to honor the past, celebrate the present, and empower the future of women in cycling and the opportunity for positive social change. Encourage women to ride and they will change the world! Philadelphia's Cyclofemme Ride is a collaboration between our Women Bike PHL program and the Sturdy Girls Cycling Club. Free rides beginning and ending at Clark Park: beginner, intermediate, and fast ride options. All people welcome (not just women), helmets required. Stay for a post-ride picnic in Clark Park! Looking for a bike ride where no one expects you to go fast? Or even...one where you're SUPPOSED to take your time? This is it. A social, take-your-time-paced bike ride, on the second Tuesday of every month. We meet at 6:15 PM at the Northwest Corner of Rittenhouse Square Park (across from the church) to roll at 6:30. This month we're riding to Frankford Hall (~3.5 miles). New to city biking? This free, one-hour class will give you tips and directions to confidently and safely bike on Philly streets. No bike needed. This class is through our Women Bike PHL program and is women-only. What better way to celebrate bike to work day than a bike ride with the Mayor? Join bicyclists -- both veterans and newbies -- at Lloyd Hall (on Boathouse Row) at 7:30am. Light breakfast provided by Cosmic Catering. We'll ride as a group from Lloyd Hall down the Parkway to LOVE Park. Ride leaves at 8:15, short press conference to follow. All are welcome! You know it. You love it. It's back. "Free and open to the public, the Trenton Avenue Arts Festival celebrates East Kensington's incredible mix of local artists, musicians and eateries." Where to do the bikes fit in? The event features the Kensington Kinetic Sculpture Derby, a design competition and parade of human-powered vehicle floats. Keep an eye out for the entry from our young friends from Neighborhood Bike Works! Festival runs 11-6, Derby kicks off at noon. Philadelphia's group for parents and kids on bikes, Kidical Mass, is riding in the Kensington Kinetic Sculpture Derby (at the end of the parade!). We agree that the bakfietsen and other fancy cargo bikes some of these parents pedal around are definitely parade-worthy! If you'd like to join, check out the Facebook event and email Dena at phillykidicalmass(at)gmail.com to fill out a waiver ahead of time! A somber but important event, the annual Ride of Silence honors cyclists killed/injured in motor vehicle related crashes and to raise awareness about the rights of cyclists to ride on the roads. The ride is being held in Philadelphia for the ninth gear in a row. Sister events are expected to be held this year in over 300 U.S. locations and in over 15 countries. We will ride 8 miles in silence through Center City, taking approximately 1 hour. Ride begins and ends at the front steps of the Philadelphia Art Museum on the Ben Franklin Parkway. A brief pre-ride dedication ceremony will take place at 6:45 PM and the ride will start promptly at 7:00 PM. The ride before the race.Anonymousnoreply@blogger.com0tag:blogger.com,1999:blog-5227147.post-33091475974705877732014-04-24T10:21:00.000-04:002014-04-24T10:21:05.463-04:00Bike Share Rolls Closer to Philadelphia with Vendor and Timeline AnnouncementToday the City of Philadelphia moved one big step closer to the launch of our much-anticipated, much-needed bike share system. A Philadelphia Inquirer article this morning names the City's selected vendors for supplying the equipment, running the system, and marketing the naming rights. An official press conference is set for 2:00 PM today on the Art Museum steps. Mayor Nutter checking out bike share bikes at an exhibition in Rittenhouse Square this time last year. The City has selected vendors whose resumés give us confidence in their ability to deliver a world-class bike share system. The equipment vendor, B Cycle, has a good track record of providing high-quality, reliable bike share bikes. For the curious, they are not the bike share company which drew some attention recently for declaring bankruptcy. Bicycle Transit Systems (aka Bicycle Trans) has been selected to run the system. On paper they are a new firm, but they are staffed by people with extensive knowledge of launching and running other cities' bike share systems. And they are based in Philadelphia! For those curious about our role in this, we have been advisers to the city's deliberations up to this point, and will be taking a lead role in the equity component of bike share - making sure the system is accessible to all Philadelphians. But we will not be running the system. Philadelphia is behind other cities in the adoption and implementation of a bike share system. But one advantage of this is that we can learn from the best practices honed in those other cities. (One example of that is hiring a marketing firm explicitly to secure corporate sponsorship.) And we are pleased that Philadelphia is taking the time to get this right, and launch in the spring when adoption will be easiest. If you like your news fresh and locally-sourced, you can attend the press conference today at 2PM at the Art Museum Steps. You can also check out the Philadelphia Inquirer and WHYY Newsworks coverage.Anonymousnoreply@blogger.com0tag:blogger.com,1999:blog-5227147.post-31771078227592500922014-04-22T10:47:00.000-04:002014-04-22T10:47:05.421-04:00New Report Finds Evidence That Greater Bicycling Means Greater SafetyThe Alliance for Biking & Walking released a major benchmarking report covering data and research on walking and bicycling across the country. The goal is to identify trends and examine how they relate to public health, safety, and social and economic well-being. Any and all bicycle trips count! Warning: the bicyclist shown here is an immortal professional. Do not attempt. In a nutshell, it is a nation-wide friendly competition to encourage bicycling by making it a contest. Using the website or one of three(!) smartphone apps, you can log the trips you take by bicycle. You are awarded points for those trips, and points allow for competition on a individual, team, workplace, school, city, and state level. The challenge rewards riding frequency over distance. It's about using your bike for a wide variety of trips, and encouraging others to give it a try! You can register anytime, even after the start on May 1st. For more information, check out the site's FAQ. If you already bike regularly, it can be a fun way to compete against your fellow bicycling friends. Form two teams of friends and place a wager on monthly or summer-long totals. The Challenge offers a fun, engaging framework through which to encourage a partner, friend, or coworker to give bicycling a try. The League of American Bicyclists offers prizes based on points level, up to and including new bicycles. Workplaces that encourage bicycle commuting have healthier, more productive employees. The challenge begins May 1st. Register today, get your profile and team set up, and start bicycling!Anonymousnoreply@blogger.com0tag:blogger.com,1999:blog-5227147.post-2051076849984458742014-04-17T09:48:00.000-04:002014-04-17T09:48:19.883-04:00How to Keep the South Street Bridge Bike Lane Safe After CHOP ExpansionChildren’s Hospital of Philadelphia has proposed a new building for Schuylkill Avenue with driveways that will connect to the South Street Bridge. We testified on the project at the April 1st Civic Design Review meeting and sent a letter to CHOP today that further clarifies our concerns about the impact of the driveways on the bike lane. Correction - DRPA has announced that only the north walkway will be open on Thursday, from 5AM to midnight. The south walkway will be closed all day. The combination of bikes, trails, live music, food trucks, and site-specific art installations typically makes us think of Philadelphia (woot woot!). But now Camden is getting into the act, with the Camden Night Gardens this Thursday. 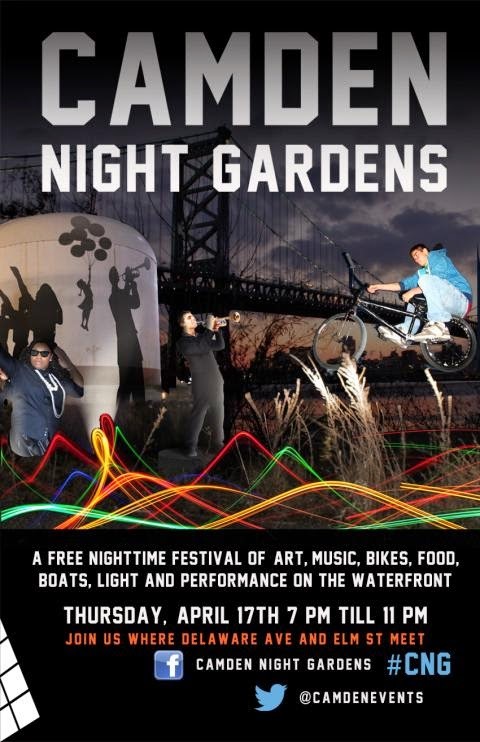 The Camden Night Gardens is a free night time art and bike festival on the Camden Waterfront that will take place on Thursday, April 17th from 7:00PM-11:00PM. It will feature local artist performances (music and dance), digital and physically produced projections, site-specific art installations, an illuminated BMX performance, a water-based light production, the presentation of historic record players and recordings, a bike tune-up station and a bike parade. The Riverfront State Prison used to loom over the Camden neighborhood north of the Ben Franklin Bridge. Now it's an empty lot and its perimeter road, known informally as the Jail Trail, offers unique views of the bridge and Philly skyline. This event is a community-oriented repurposing of that trail and land. John Boylenoreply@blogger.com0tag:blogger.com,1999:blog-5227147.post-76424199373996632212014-04-10T11:43:00.002-04:002014-04-10T12:26:39.476-04:00The Parking Authority Follows Up on Blocked Bike Lane ComplaintsThe Parking Authority has given us the preliminary results of the #unblockbikelanes Twitter campaign and has promised us additional measures to improve the enforcement of parking restrictions in bike lanes. This past December, we helped the Philadelphia Parking Authority launch a Twitter campaign to identify which bike lanes are most chronically blocked by motor vehicles. The PPA reports that over three months (approximately Jan-March), the #unblockbikelanes campaign generated 55 complaints covering 20 different streets. Over the same three months, the PPA and the Police Department wrote 264 tickets for parking in bike lanes at a subset of those locations. We took the data they gave us and made a basic map comparing the location of complaints with the ticket locations. Red lines indicate where complaints were made and tickets written. Blue dots indicate where complaints were made but no tickets written. The thicker the red line, the more tickets were written on that street. The main takeaway of this data is that the bulk of tickets are being written on the streets receiving the most complaints: Spruce & Pine Streets, N. 13th Street (between Filbert & Arch), and N. 22nd (near Lombard Street, in front of the 7-Eleven). Have a supervisor do a test run of placing a PPA Officer on a "bike lane detail" to cover Spruce & Pine (Front to 22nd Street), 13th and 22nd Streets. Direct more officers to enforcement on Fairmount Avenue. Direct more enforcement during peak hours and assign supervisors to the entire lengths of Spruce and Pine Streets. Direct more enforcement during morning peak hours on 22nd Street, especially at the intersection of Lombard and 22nd Street. Assign more mobile units to 13th Street b/w Filbert and Arch Street between 8am - 2pm. Have supervisors review the religious institutions' "courtesy" blocks with PPA Officers. We appreciate the PPA being responsive to our concerns and the concerns of the thousands of bicyclists who use Philadelphia's bike lanes daily. Data shows that bike lanes make streets safer for all users, drivers included, so enforcing no-parking regulations in those lanes contributes to safer streets and fewer injuries all around. UPDATE 12:15PM: In our meeting with the PPA, the topic of PPA vehicles blocking bike lanes was brought up. Our contact there said they have noticed those reports, and are instructing their officers to not do that. It is worth remembering that a PPA vehicle can stop in a bike lane to load or unload officers, same as a private vehicle or cab can load or unload passengers. Sarah Clark Stuarthttp://www.blogger.com/profile/06169616086131547539noreply@blogger.com3tag:blogger.com,1999:blog-5227147.post-47186293460178929022014-04-09T11:38:00.001-04:002014-04-09T11:38:36.533-04:00PennDOT Announces New Bike/Ped Funding Opportunity In 2013, Harrisburg passed a big transportation bill (Act 89). One of its primary benefits is the $80 million Multimodal Fund. This fun is a new opportunity for municipalities to seek funding for bike/ped projects such as striping new bike lanes, trails, bicycle parking at transit stops, sidewalk connections, and more. On April 7th, a PennDOT press release announced that the fund was open for applications. "PennDOT can make available $20 million in Fiscal Year 2014-15 to distribute to successful applicants. Eligible projects can cost between $100,000 and $3 million and they require a 30 percent match from local sources. PennDOT will evaluate the applications and make selections based on such criteria as safety benefits, regional economic conditions, the technical and financial feasibility, job creation, energy efficiency, and operational sustainability. Besides the $20 million in unrestricted funds to be distributed, PennDOT may award grants from the dedicated budget categories in the Multimodal fund for aviation, rail freight, ports and bicycle-pedestrian projects. The application period started today and closes on June 30." So if you are a municipality, Council of Government, business or non-profit, now's the time to apply for this money! Act 89 dedicates $2 million of the Multimodal fund for bicycle-pedestrian projects. Eligible projects include: "A project which coordinates local land use with transportation assets to enhance existing communities, including but not limited to: sidewalk/crosswalk safety improvements, bicycle lanes/route designation, greenways.... and [a] project related to streetscape, lighting, sidewalk enhancement and pedestrian safety, including but not limited to: sidewalk connections, crosswalks, pedestrian and traffic signals, pedestrian signs, and lighting etc..and [a] project improving connectivity or utilization of existing transportation assets, including but not limited to: bicycle/shared markings, bicycle parking at transit stops..."
Important details: the local 30% match must be cash (not in-kind) and applications must include a municipal resolutiton requesting the grant. PennDOT's fund is separate from the Multimodal Transportation Fund being administered by the Commonwealth Financing Authority. It's nearly summer, that magical time when a man's heart, a woman's heart, a child's heart, and all other hearts turn towards thoughts of bicycling. This yearning-heart-turning can cause mild chest discomfort if you don't rotate your torso at the appropriate time and point your heart towards a nearby bicycle. (For office workers, we recommend swivel chairs.) And all this bicycle yearning, taken in aggregate, makes our spring and summer months wicked busy. So we need some help! We are looking for a communications intern to help us expand our capacity and stave off any local bicycle heart arrhythmia due to erratic or oxygen-deficient bicycle news. The job description is below, or available via this link. Applications will be accepted until Friday, April 25th. So come work with us! This is a great opportunity for a college student interested in getting some real-world communications experience, or for a writer or journalist interested in producing written web content and dabbling in communications or web community management. Anonymousnoreply@blogger.com0tag:blogger.com,1999:blog-5227147.post-90765508973036312282014-04-03T12:33:00.000-04:002014-04-03T12:33:19.740-04:00Bon Voyage and Happy Riding to Hans, Ellen, and ShayneThree longtime advocates for better bicycling in our region are moving to (relatively) distant lands. So we take a moment to remark upon, and thank, Hans, Ellen, and Shayne for the good work they've done on all of our behalf. Hans has traveled the world on his recumbent bicycle, and in 2009 he expanded the scope of his efforts to take on federal transportation policy reform and national bicycle advocacy. In that year he became the president of the League of American Bicyclists. Now in his seventies, Hans is retiring from East Coast bicycle advocacy by moving to the bicycle-friendly confines of the Pacific Northwest. We don't think they need him out there, but we are happy for Hans for his move. Since the 1990's the Chester County Cycling Coalition (CCCC) has been a functioning committee of the Bicycle Coalition. The CCCC's volunteer activity has waxed and waned over the years, following the momentum and energy of those engaged in the group's work. The CCCC's work experienced a big spike in energy and activity in late 2009 when Ellen Zadoff was elected chair. She brought a new energy into the group, and her victories included helping to create a bicycle plan for West Chester and creating Chester County's own Share the Road education campaign. Earlier this year Ellen announced that she is also moving out of the area and stepped down as chair. Her energy and enthusiasm will be missed. Shayne Trimbell could be described as a planning advocate. A dedicated bike commuter, he was the Manager of Projects and Development at Greater Valley Forge TMA (GVFTMA). Shayne was also an active board member for PA Walks and Bikes, and represented them at the National Bike Summit in Washington D.C.. Shayne was a member of the Chester County Cycling Coalition for two years and took over the chairmanship of the CCCC following Ellen's resignation. One of Shayne's priorities was to convince local communities to adapt their trail and bike plans into the official municipal map, which cements the facilitation of adding bike facilities as new developments arise. But as fate would have it Shayne has just recently accepted a new job in Massachusetts. We will miss his many-sided work on bicycle and transportation efforts in our region. It is worth noting that this sudden exodus of leadership is not leaving a total vacuum. Kyle Guie, another planner at GVFTMA, has accepted the chair position of CCCC. Kyle is a resident of Phoenixville and we look forward to working with him to ensure that the Chester County Cycling Coalition continues their important work in Chester County.John Boylenoreply@blogger.com2tag:blogger.com,1999:blog-5227147.post-12111373698428793632014-03-31T12:56:00.002-04:002014-03-31T12:56:19.397-04:00Impact of CHOP Expansion Upon South Street Bridge on Meeting Agendas This WeekRecently news broke of the Children's Hospital of Philadelphia (CHOP)'s plans to build a new building adjacent to the South Street Bridge on the east side of the river. The building will impact the bike lane and sidewalk on the bridge. Disclosure: CHOP's Vice President for Government Affairs, Peter Grollman, serves on the Board of the Bicycle Coalition of Greater Philadelphia.Sarah Clark Stuarthttp://www.blogger.com/profile/06169616086131547539noreply@blogger.com2tag:blogger.com,1999:blog-5227147.post-49901276827106530832014-03-31T10:31:00.000-04:002014-03-31T10:31:11.279-04:00Public Meeting About Philly Parks Funding This WednesdayOur friends at the Philadelphia Parks Alliance are calling allies of Philly's park system to attend an important budget hearing happening this Wednesday at 1pm at City Hall. Below is text from the PPA (this PPA, not the other PPA) flyer. Surely, surely, any day now spring is going to burst through the door like the Kool-Aid Man. With spring comes an explosion of bicycling and bicycling-related events. So if you've ever been interested in taking your bicycling to the next level and volunteering, here's a good way to get started. Join us for our monthly volunteer night. RSVP by clicking here or filling out the form below (they're the same). The Bicycle Club of Philadelphia is hosting a cleanup project as part of the Streets Department's April 5th Philly Spring Cleanup. The project is to sweep the two Columbus Boulevard bike lanes from Oregon heading south to the intersection of Front Street and Pattison Avenue. The Streets Department will close one side of the Boulevard at a time during the cleanup. The Streets Department is assigning sweepers, and volunteers will bag and hand off debris to Streets Department personnel. The cleanup project starts at 9am. Volunteers are meeting at the intersection of Columbus and Oregon. Want to help your community and your bike ride by chipping in? You can join others in a ride to the event. You can RSVP by sending an email to Owen Sindler (sindlero@gmail.com) or registering through the Philly Spring Clean up volunteer form. If seen, do not attempt to ride over it. Take alternate line and contact us immediately. May answer to "Hendrick." Be alert, bicyclists! This emphatic winter caused a lot of damage to our roads, and rumors are flying about opportunistic "potholes" hanging out in bike lanes and attempting to pop tires or just give bicyclists a jarring bump. We have posted above a Streets Department Police sketch artist's composite of what one might look like (side note: the Streets Dept. has some really talented visual artists on staff. Maybe consider a graphic novel?). Post a message on our Facebook page. Also, while you're at it, you should follow us on Twitter and Facebook. That's a good place to ask us questions, learn about breaking or cool bike information, and meet other engaged bicyclists in the area. And potholes can't follow you online (yet).Anonymousnoreply@blogger.com0tag:blogger.com,1999:blog-5227147.post-79980373495846896452014-03-20T09:40:00.000-04:002014-03-20T09:41:19.443-04:00Bike Racks and Bicycle Art on Display in City HallThe Flower Show has ended, but not your chance to see the beautiful bicycle racks coming to Center City later this summer. The racks have moved to the Art Gallery at City Hall (did you know there was an art gallery in City Hall? Well now you do!) for a three-month installation. This installation will feature two racks which did not make it into the Flower Show. And complimenting the racks like a fine wine pairing will be Bike p'ARTs, a collection of art utilizing bicycle parts to explore themes of sustainability, health, and the urban environment. The art in this new collection is contributed by eleven local artists: Regina Kelly Barthmaier, Robert Barabos, Charlize Katzenbach, Jennifer Lynn, Gerry Marron, Eric Mozes and Donnell Powell of Color My Sidewalk, Elicia “Eel-Eye” Avenue, Scott White, Kendal Wilkins and Raphael Xavier. There will be an artists reception on April 9th from 5:00-7:00 pm in the gallery space. Anonymousnoreply@blogger.com0tag:blogger.com,1999:blog-5227147.post-20621906442823304222014-03-13T10:05:00.004-04:002014-03-13T10:05:42.289-04:00Improved Bike Lanes, Fewer Vehicle Lanes Proposed for Washington AvenueTuesday night the Philadelphia City Planning Commission (PCPC) presented the draft design for the reconfiguration of Washington Avenue from Columbus Blvd to Grays Ferry Avenue. The project has a quick timetable: it could be completed this summer as part of the City's road resurfacing program. What is certain is that Washington Avenue sees too many injuries to pedestrians and bicyclists, and something must be done to lower those numbers. Below is the proposed revised road markings. Christine Fisher covered the plan over at PlanPhilly. Plans call for reducing most of Washington Ave from 4 lanes to 3 and adding back-in angle parking. More loading zones will be created to mitigate double parking in the bike lanes. Two exceptions to this: stretches from 13th to 16th, and from 5th to Columbus Avenue, will retain the current 4 lane and parallel parking configuration. The entire corridor will include east-west standard (5 foot) bike lanes from end to end, bike boxes at Columbus, 22nd, and 11th streets, and bike racks at 9th, 10th and 11th Streets to accommodate bicycle shoppers in the Italian Market. The final striping plans are subject to discretion of the Streets Department, so the final result may vary from these plans. The South of South Neighborhood Association (SOSNA) scanned the documents below for the section west of Broad St.
Read more »Bike Coalitionhttp://www.blogger.com/profile/08568011077495731160noreply@blogger.com2tag:blogger.com,1999:blog-5227147.post-11815475188086265182014-03-12T10:21:00.004-04:002014-03-12T10:21:32.386-04:00Supreme Court's Rails to Trails Ruling Won't Affect Our Region's TrailsThe trail world is abuzz over Monday's Supreme Court ruling in favor of the Wyoming land owners Marvin Brandt Revocable Trust. The ruling awarded ownership of a mile section of the Medicine Bow Rail Trail to the trust, whose land surrounds the trail. The case is considered to be a major blow to rail-trail development and may result in the closing of hundreds of miles of rail trails in Western United States. While this is a very troubling development for our Western colleagues, the decision will not affect any trails on the Circuit. The Rails-To-Trails Conservancy has created this neat infographic below. The last checkpoint at the bottom should put any local fears to rest. To find out more about the case go to www.railstotrails.org/supremecourt. Today Alex, John, Sarah, Megan, and Katie are joining two dozen other Pennsylvania and New Jersey residents and hundreds of people from around the country on Capitol Hill to speak with their elected officials about bicycling and walking. It's part of the National Bike Summit, and one of the many ways the Bicycle Coalition of Greater Philadelphia is working to improve the safety and accessibility of bicycling and walking in our region. You can learn what the first two bills do in the graphics embedded below. A factsheet for the third bill is here. Find the contact info for your U.S. Representative using this razzle dazzle fancy Internet website contraption machine. Imagine sitting at home, pondering dinner, and feeling like you haven't ordered pizza in who-knows-how-long. Then simultaneously one friend shows up at your door suggesting you order some pizza, while another friend calls you on the phone asking if you'd like to order some pizza tonight. That's the effect we're striving to have on our elected officials today. But replace "pizza" with "co-sponsoring legislation that makes bicycling safer in Pennsylvania and New Jersey." Support Alex, John, Sarah, Megan, Katie, and your neighbors and friends who are meeting today with lawmakers and their staffs. Call your congressional offices and ask that your senators and representatives co-sponsor these three bills.Anonymousnoreply@blogger.com0tag:blogger.com,1999:blog-5227147.post-24400697175797391442014-03-04T09:34:00.000-05:002014-03-04T09:34:10.801-05:00Job Opening: PT Position With Bike Rack Manufacturer in PhiladelphiaPassing along a job opportunity for bicycle-oriented folks in the Philly area. This position is not affiliated with us in any way, we're just spreading the word. Making visits to Philadelphia-area businesses, construction sites, universities, etcetera where bike rooms / bicycle parking is needed. Communicating with customers about products. Opportunity to expand role into sales and design. Ideal candidate is readily available in Greater Philadelphia, honest; efficient, with an interest in bicycling. Part-time work may be a good fit for passionate cyclists, bike advocates, sports industry pros, students, artists. If interested, please email resume and cover letter (subject line: "Philadelphia bike parking") to: ben@bencramer.org. Anonymousnoreply@blogger.com0tag:blogger.com,1999:blog-5227147.post-88776075881038176202014-03-03T14:26:00.005-05:002014-03-03T15:27:23.911-05:00The One All-Weather Display at the Flower Show is TerrificThe Philadelphia Flower Show has opened and will remain open until Sunday. That means this is your first chance to see the winning designs from the bicycle rack contest we ran last year! Seven of the ten winning racks are featured in the display, which can be seen in the Grand Hall Concourse near the food and drink (closest entrance is the Market Street entrance between 11th and 12th). This summer, all ten racks will be permanently installed in prominent places in and near Center City Philadelphia. We will have glossy photos of all the racks to share with you next week. But in the meantime, we encourage you to check them out in person. While the idea of attending a flower show right now might seem absurd, it's actually the best in-city respite we can think of from the feeling that winter will never leave. Lastly, but not least-ly, a tremendous number of people worked very hard to bring this display together. Ralph Tullie | RJ Florig Industrial Co. Inc. It's hard to imagine, but spring is right around the corner! And with that comes a joyful explosion of bicycling. Spring is our busiest time of the year, and that means new volunteering opportunities. Whether you're a regular volunteer or have never been to our office before, come to our volunteer night this upcoming Wednesday! Our volunteer nights are a good entry point into the work we do and how you can get involved in making Philly a better, safer city for bicycling.